A. 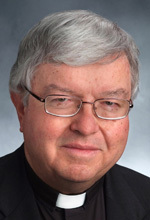 As your question would suggest, aside from certain blessings reserved to a bishop (e.g., the consecration of the sacramental oils at the chrism Mass during Holy Week), it is a priest who normally imparts a Catholic blessing. Certain blessings also are entrusted to deacons — at rites where a deacon is presiding, such as a baptism, a wedding ceremony or the distribution of holy Communion outside of Mass. But many blessings are done properly — and perhaps more appropriately — by laypeople. The most common example is the blessing of food before a meal, which many families do each evening around the dinner table. Another example recommended by the Book of Blessings is the blessing of a newly engaged couple by both sets of parents. Laypeople may also use a suggested prayer of blessing when moving into a new home, although more commonly the parish priest is invited to mark that joyful event. Q. I am interested in Catholic liturgies and rites outside the Roman/Latin rite. I know that Latin-rite Catholics are allowed to attend Catholic Eastern-rite liturgies on the same basis as a Latin-rite Mass and also to receive Communion at them. I have been to a number (Maronite, Ukrainian, Ruthenian). But my question regards the Personal Ordinariate of the Chair of St. Peter, which was set up to allow Anglicans to join the Catholic Church without abandoning all of their liturgical traditions. A. First, let’s review the history. In 2012, the Vatican created the Personal Ordinariate of the Chair of St. Peter you mention. It is similar to a diocese, in response to repeated inquiries from Anglican groups who were seeking to become Catholic. This ordinariate includes communities in the Unites States and Canada, while similar ones were created in Australia and for England and Wales. The ordinariate enables former Anglicans, once they have become Catholic, to retain many aspects of Anglican heritage and traditions. The liturgy that is celebrated looks very similar to an Anglican service, using texts that incorporate Anglican prayers. In answer to your question, yes, any Catholic is welcome to attend and to participate in liturgies of the ordinariate, just as members of the ordinariate are welcome at liturgies in other Catholic churches. However, the ordinariate is really intended for those coming from an Anglican tradition.